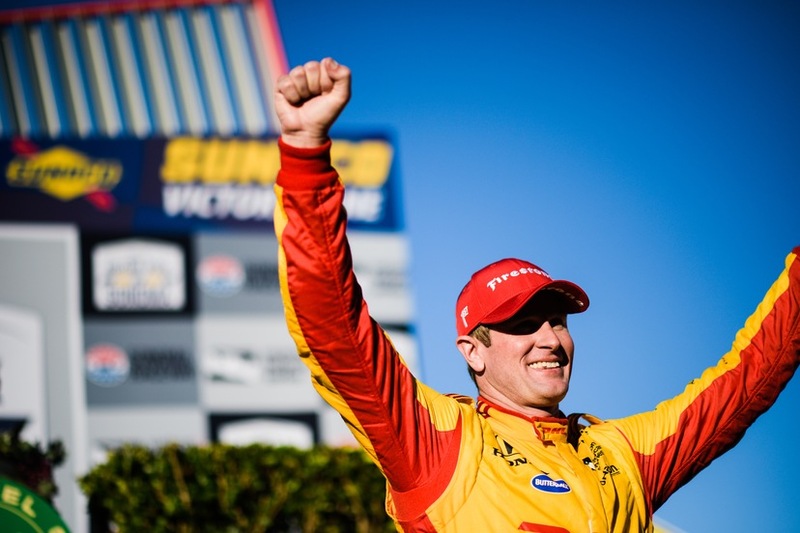 Ryan Hunter-Reay totally dominated the INDYCAR Grand Prix of Sonoma, winning for the second time in the Verizon IndyCar Series 2018 season. The Florida resident started from the pole and was never challenged en route to victory at the Sonoma Raceway while driving the DHL Honda of Andretti Autosport. The victor led 80 of the 85 laps around the scenic 2.38-mile road course. And he captured his 18th series win and his first at Sonoma. “I felt like the race just didn’t want to end. I guess that’s what happens when you spend the whole day out front,” said Hunter-Reay. “Any time I needed the pace to put it down, we leapt out to a lead, I was able to maintain that. “Hats off to this team, DHL, Auto Nation, Honda. Honda really gave me great drivability, reliability. The Firestone tires were great. Shout out to Kerry Doughty, CO of Butterball, fighting cancer at home right now. His name was on the side of our car today. Special win for him. Also, a big shout out to Robby Wickens, wanted to dedicate that win to him and his fight. Hopefully, he will be back with us as soon as possible. “I’m going to miss this place. It’s unbelievable. All these years I’ve been trying to win here, now we win, we’re not coming back. We seem to have the secret, the setup now, and we can’t use it. I hope we’re back not in 2019, but in 2020. Hopefully we can get this resolved and get two northern California races on the schedule. While the race leader and eventual winner usually receives all the attention, this wasn’t the case today as most eyes were on the series championship contenders Scott Dixon and Alexander Rossi, who were separated by 27 points going into the race. In running second throughout and finishing runner-up, Dixon walked away with his fifth Verizon IndyCar Series championship. Asked how he feels about being one of the sport’s greatest drivers just behind A. J. Foyt and Mario Andretti in wins, he said, “I don’t see myself that way at all. Again, I feel lucky. I’m very, very blessed in many ways. Racing career, to meet the love of my life with Emma. Have a great family. Two beautiful girls. “I don’t know. I feel lucky I get to do what I love to do. I enjoy racing. I get to work with the best in the business. I don’t know. I just don’t see it that way. I hope that I continue for more years to come and enjoy the sport for what it is. “When you get into these situations where there’s a lot on the line, sometimes this even weekend, you don’t really enjoy it as much. I think over the past couple years, I think we’ve really tried to enjoy the atmosphere that we’re in, the people that we get to work with, the friends and everybody in the business. Rossi had a tough day starting on the opening lap when he tagged teammate Marco Andretti, flattening one tire and damaging a front wing. Driving slowly to the pits for repairs and losing precious time, Rossi dropped to the back of the 25-car field, forcing a change in his team’s race strategy. Midway through the 85-lap race, Rossi took advantage of a yellow flag to regain the lead lap and get back into contention. Driving hard, Rossi got as high as fifth before having to settle for seventh after wearing out his tires. “It was very unfortunate what happened in the first turn but at end of the day, it has been a good season,” he said with dejection ringing in his voice. Behind Hunter-Reay and Dixon, the finishing order was Will Power, Simon Pagenaud, Andretti, Sebastien Bourdais, Rossi, Josef Newgarden, rookie sensation Patricio O’Ward and Ed Jones. Racing in his 300th consecutive Indy car race, Tony Kanaan battled to a 12th place finish.